First things first, it took me a while to select a week which I felt nicely represented one of a “first-year medical student”. My timetable changes week on week, so every week it is actually slightly different to the week before. This past week has the shared skeleton which every week has, so I’ll talk through that as well as the variations our schedules have on a weekly basis. One of the things you may have noticed straight away is how empty my timetable looks. I remember when I first got my timetable I was quite surprised by that, but then you very quickly realise the white spaces aren’t actually gaps at all. Instead, they’re for all the independent study we have to do! I had my PBL opening session. Here we just read through the case, discuss the areas we don’t understand and create a list of questions that we can go away and answer – we call that our learning agenda. I tend not to have much else on Mondays apart from one week I had my GP placement during the huge blank in the afternoon. Sometimes we schedule in meetings with our PEP group during that time, which is basically a group research project we have to work on, but more details will come up on that in a later post. The free time is great though, I like to work on Anatomy on Mondays and if I’m lucky I might be able to get it finished all in one day! Every Tuesday we have 3 lectures in the afternoon. They tend to be 3 lectures that are relevant to the case and may help us to answer some of our PBL questions, but sometimes some of these may be information lectures about exams or different course components. About every other week on Tuesday mornings I have a Histology session or an EBM (Evidence-Based Medicine) session, so I don’t always have that time to myself. But on the weeks that I do, I like to wake up early and head off to the library and formally make a start on the week’s PBL case. Wednesdays are brilliant because all we have is 3 early morning lectures and then we’re completely free for the rest of the day. We never have any teaching on Wednesday afternoons, but this week you may notice there’s an event scheduled in. This was an optional event we could go to where the family and friends of the donors we use for dissection were invited. It was an opportunity for us to show our appreciation for what they’ve done. I thought it was a really nice event and it was also really enlightening to speak to some of the relatives. 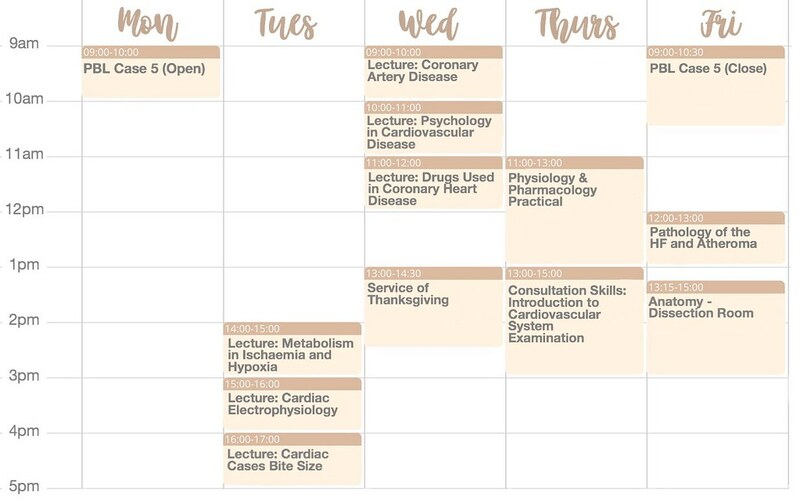 We have Physiology and Pharmacology which is a lab-based practical and probably my favourite session of the week. Here we try different drugs and carry out little mini experiments of each other which is pretty cool. Communication is always straight after that so unfortunately, I miss my lunch on Thursdays. In communication, we practise talking to stimulated patients and discuss consultation styles and approaches for talking to patients about certain issues. It’s quite a reflective session with you teaching each other and giving feedback. More recently, we’ve been learning a few basic examinations which we’ve been practising on each other. This week we did the cardiovascular examination! As you can see, I have an early start with my PBL closing session in which we discuss our findings, clarify things we didn’t understand and identify areas that need further work. We then have a closing case lecture, which tends to summarise the case and can also be useful in helping identify holes in our week’s learning. And then to finish the week I have my Anatomy session which involves a bit of testing of the week’s anatomy work and sometimes a bit of dissecting too. It’s pretty cool to see structure you’ve learned about in real life because it looks so different and can also be helpful in allowing you to piece it all together and picture everything. And that’s my typical week! Yeah I definitely agree with that! When the lectures don’t cover everything it takes so much time filling in the gaps and when they’re in a huge amount of detail…it’s listening back to them and trying to understand them that takes the time! Oh wow…Is imperial’s course traditional? Omg I cant wait to get into med school. This just makes me more and ore excited to get started.